The storm had passed. And had left a trail of destruction in its wake. To begin with, Raunak couldn’t reach his office and attend the meeting. The American delegates were furious at Raunak’s unprofessional conduct and had left his office assuring him that he would never get the contract. And then he had to bear the brunt of the policemen’s reprimand for giving shelter to a wanted criminal. None of his excuses worked on them, even though they knew that Raunak was the real victim here and not an abettor of the crime. It took him, Lajjo, and their lawyer, hours to convince the police that they were completely unaware of Sajjan’s background and that they were misguided by their neighbours, the Sharmas, who had recommended Sajjan Singh to them. 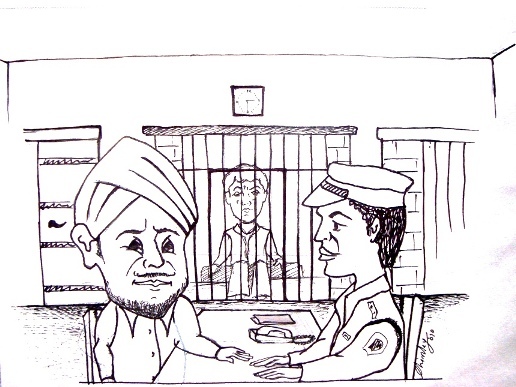 “The Sharmas you say, eh?” The chief inspector asked, scrutinizing Raunak’s face carefully. And so after signing some papers and having received tons of warning and advice, Raunak Singh was released. And this whole process was “greased” and accelerated with the help of a few banknotes, which the noble policemen took as a “reward” for their efforts from the hands of the very grateful Raunak Singh. And now the Sharmas. Poor Sharmas! They were “gotten hold of” nicely by the police. As if Raunak’s trip to police station and Sajjan’s status as a runaway criminal wasn’t enough for the gossip mongers in the colony, Sharmas’ questioning by the police was also added to the grapevine. But the Sharmas were themselves shocked by Sajjan’s true identity and told police everything they knew. Apparently Sajjan had fooled them too in believing that he was a seasoned driver. Mr. Sharma’s boss had fired him within a week because of his rash driving and he came to Mr. Sharma with his tale of woes and well…you know the rest. What about Raunak and Lajjo? They were in depression for more than a week. Raunak’s fears had come true and he had lost the biggest deal of his professional career and Lajjo, deep down in her heart, felt guilty for whatever had happened. But God has strange ways of making things happen. One day, after about a month of the infamous day of Sajjan’s firing, Raunak came home with such good news that the Singh household came back to life again. “Really! That’s great news!” Lajjo said giving an unusual smile. “I also have good news for you.” She came out with the truth. Seeing Lajjo’s miserable face after this outburst made Raunak realize that he had probably said too much. Lajjo said nothing. She just turned away and went to the kitchen. Raunak’s heart sank. He knew that unless he did something to ease the tension in the air, he would have to go on an empty stomach that night. And the food, in the next few days, was sure to taste strange, sometimes more spicy, sometimes less salty. Such are the gastronomical dangers of upsetting a devoted wife. Raunak felt weak in his determination. If her brother himself had made the search, he thought, he need not worry so much. A brother won’t think of harming his sister. Besides, he would interview the driver and satisfy himself before hiring. Deep down, he knew that selling the Mercedes wasn’t a feasible solution. Raunak slowly walked towards the kitchen and saw Lajjo working in a fury. He tiptoed into the kitchen and held Lajjo in his arms from behind. Cut! Come back next Thursday!